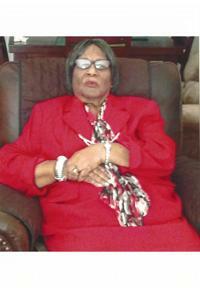 Obituary for Dorothy Booker | Robinson & Son Mortuary, Inc.
Dorothy Booker, 93, of 106 Mistletoe Way, widow of Tommie Lee Booker, entered eternal rest on September 4, 2018 at her home. Born in Ninety Six, SC, she was the daughter of the late Jesse Blocker and the late Mary Syrkett. She was a member of Old Mt. Zion Baptist Church and a member of the Women Aide Society #104. She is preceded in death by three sons Larry, Willie, and Rex Booker, one daughter Dorothy Jean Holloway, two sisters Willie Mae Watts and Annie F. Fisher. She leaves to cherish her memories one son Stanley (Diane) Booker of Columbia, SC; four daughters Mary (Clifford) Hill, Delois Dorn, Joann Booker, all of Greenwood, Tammy (Barry) Conway of Hodges; one brother John Henry (Sarah) Blocker of Epworth; one sister Rosie Lee Roundtree of Greenwood; fourteen grandchildren; fourteen great-grandchildren and other relatives and friends to mourn her passing. Funeral Services 2:00 PM on Sunday, September 9, 2018 at Faith Christian Center, conducted by Apostle Alvin Deal. The body will be placed in the church at 1:00 PM. Burial will follow at Evening Star Cemetery.